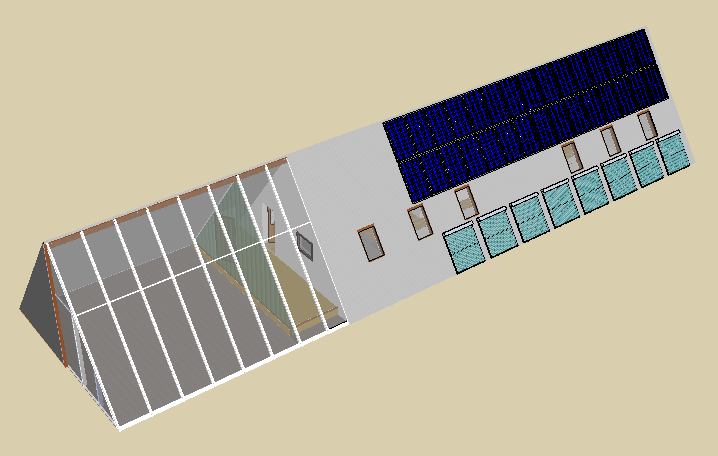 Basically, it's an A-frame design with the idea of maximising the amount of south facing roof available for various forms of solar collector. Along the bottom are evacuated-tube solar thermal panels with PV panels higher up. They're that way round mainly because PV panels are more vulnerable to small amounts of shading. Internally the layout would be, starting from the east end (the far end in the drawing): main bedroom, office/study, bathroom, kitchen/galley, living room, kitchen/galley, bathroom, guest bedroom, porch, attached greenhouse. Loft space would be over the bedrooms (for storage) and bathroom and kitchen (for all the off-grid gubbins) with higher/cathedral ceilings in the study and living room. The finished floor area would be quite small: just under 60 m² (16.2 m × 3.6 m, less a bit for some wall thickness) but the total footprint of the building would be quite a bit bigger. 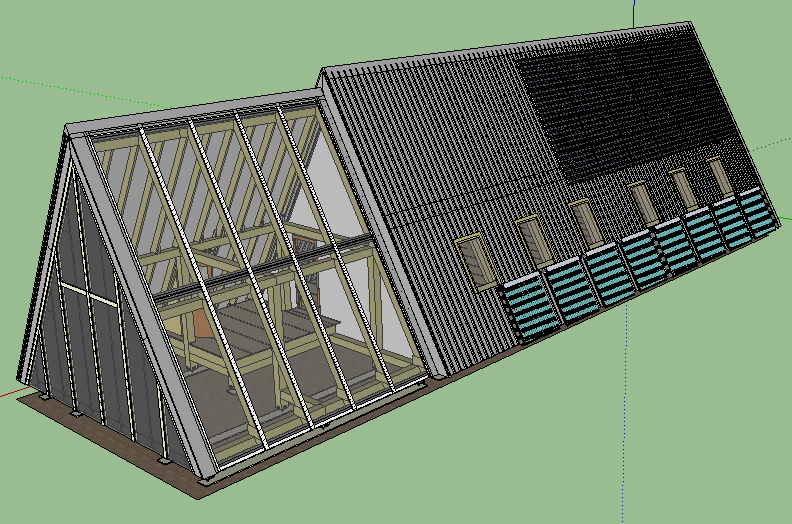 What's commonly thought of as a disadvantage of A-frame houses is the wasted space along the bottom corners but I plan to exploit that for use as a thermal store (large tanks of water). Actually, even that drawing is a bit out of date in that it shows the roofs at around 51° (designed around a 3:4:5 triange) but actually I'm now minded to make it a bit steeper, perhaps 60° or more. What I have in mind is construction on piers. The floor will be quite deep (about 450 mm from bottom surface to finished level) filled with recycled newspaper insulation simply poured in and tamped down a bit (something like this). For the roofs I'm thinking, inside to out: rafters, decking (OSB, ply or tongue & groove), vapour barrier, PIR/PUR insulation (perhaps two x 130 mm of Kingspan), sarking (OSB, presumably), metal cladding. Gable ends would be studding plus either rockwool or PIR/PUR. The idea here is to make the construction as simple as possible, avoiding complications which make airtightness and thermal bridging issues tricky to deal with. Probably the biggest issue is getting the detailing round the roof windows right. Yes, I'd prefer to use something a bit more “eco” than plastic stuff for the roof insulation. However, cost is an issue here. Saving money on part of the scheme in order to be able to afford to do other parts better seems to me to be at least arguable. Keeping the rafters completely inside the thermal envelope and the "finished" surface is a bit unusual but, apart from the simplicity noted above, does have the advantage that they contribute a small amount to the thermal mass of the house. As described, there's no service void that most houses have between plasterboard and the first structural layer. This is not likely to be much of a problem as there's the opportunity to run cables and pipes along the top of the thermal store and in the loft spaces with relatively small amounts on the office and living room walls being easy to make discrete between the rafters and end walls.